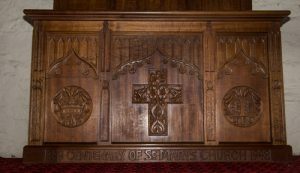 Altar, reredos, and hymn board carved 1948, St Mary’s Church, Gretna . Who was Nellie Payne? According to Russell Atkinson’s book “Ellen Nora Payne – Woodcarver of Tasmania” These three items were carved for St Mary’s Church in Gretna, Tasmania. The centenary celebrations of St. Mary’s Church of England, Gretna, reached a memorable climax on Sunday with celebration of Holy Eucharist in the church at 11 am, followed by a centenary lunch in the parish hall. The church was crowded by more than 200 parishioners and visitors, and about 80 persons outside heard the service through amplifiers. The Governor and Lady Binney, attended by Lt Mills, A.D.C., were present. The Holy Communion service was sung, and the occasional sermon was preached by the Administrator of the Diocese (Archdeacon H. B. Atkinson). 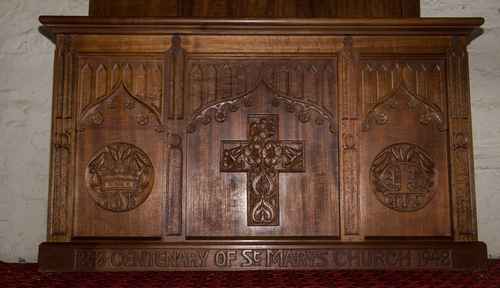 He said the hand of God had been with St. Mary’s Church during the 100 years of its existence. The parish owed a great debt to the three faithful workers to whom memorials were dedicated. 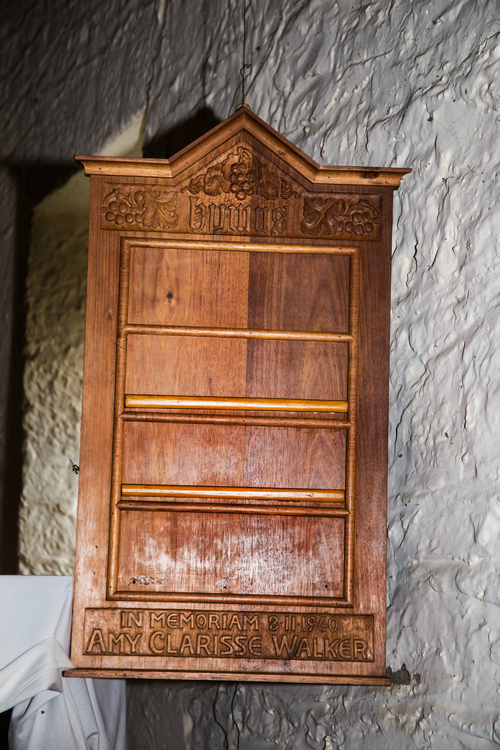 Canon F. H. Lansdell, of Launceston, a former rector, dedicated a new altar to Mrs Amy Clarisse Walker, a devoted parishioner and generous benefactor, who for more than 50 years was church organist. The altar was provided by her family and friends. 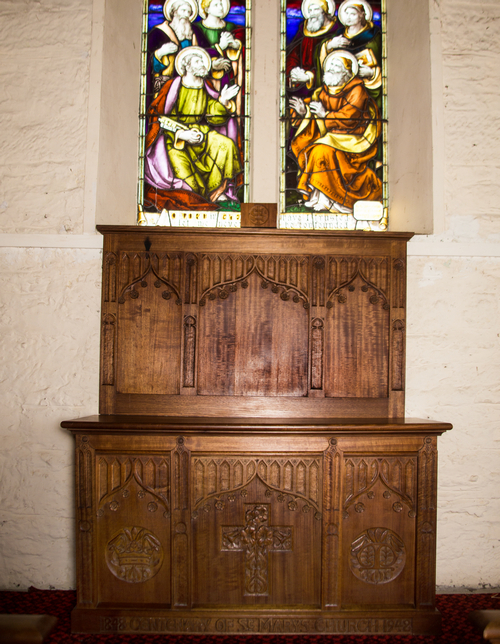 A reredos in memory of the late Rev F. Thorpe, rector of the parish for 18 years, was provided by his daughter (Mrs R. G. Downie). Communion raiIs provided by his wife and family were in memory of Mr Cecil Francis Parsons, who for many years was a church warden. The celebrant was the Rector (the Rev. T. B. McCall who was assisted by three former rectors of Macquarie Plains, Cannon Lansdell (Invermay), the Rev. K.J. Hughes (Burnie) and S.M. Mortyn (Oatlands). Mrs M.E. Deal was organist. The centenary luncheon in the parish hall was attended by the regal party and more than 200 Parishioners and visitors. The rector welcomed the Governor and Lady Binney on their first visit to the district. The Governor said the early settlers built a church almost before anything else was done. It was not difficult to understand what they were like in the Macquarie Plains Parish because so many descendants of the original settlers were still closely associated with the church today. The Governor proposed the toast “St. Mary’s Centenary.” Archdeacon Atkinson and the Rev K. J. Hughes also spoke. Mr R. E. Allwright, a church warden, responded. 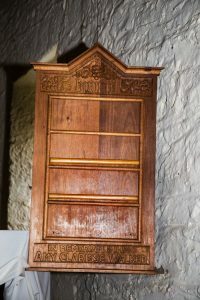 He said St. Mary’s church was almost unique in the State as 10 of the 12 rectors in the past 100 years were known to someone present at the celebrations, and each rector, individually, had done something of benefit to the district. Lady Binney cut the centenary cake. Mr McCall read messages from the Bishop (the Rt Rev G. P. Cranswick) and a former Bishop of Tasmania (Bishop Stephen).